Hubbell’s redesigned and expanded family of Watertight Wiring Devices are engineered for superior water resistance and durability. 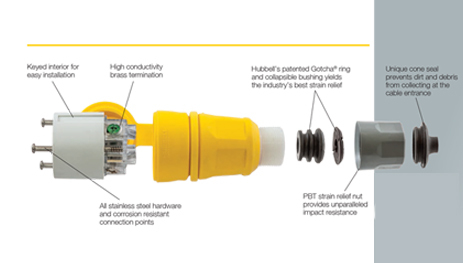 Hubbell Watertight Wiring Devices include watertight lift covers, interiors, brushings, cone seals, closure caps, FD boxes, angled adapters, portable outlet boxes and covers. Download the Hubbell Watertight Wiring Devices spec sheet below or call us at (714) 835-6211 for more information.